If you launch a product from your New York office, and a journalist from CBS (or anywhere for that matter) calls at 3:00 PM West Coast time to do a story, you might want to tell your receptionist that the response, “It’s after hours here, someone will get back to you in the morning,” is really more infuriating than helpful. 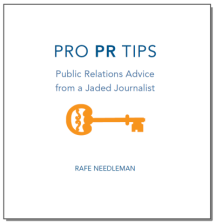 Better yet: Put contact information for your execs or your PR firm up on your Web site so said journalist doesn’t have to deal with your receptionist in the first place. See: Tip #22. I just ran into this last week while chasing down an analyst as a favor to a West coast journalist. The analyst was located in Boston, and though it was barely past six EDT, there was no good way to reach her. Thank goodness for Blackberries and red-exclamation-point emails.